WASHINGTON, Feb 7 2013 (IPS) - The world is in transition from an era of food abundance to one of scarcity. Over the last decade, world grain reserves have fallen by one third. World food prices have more than doubled, triggering a worldwide land rush and ushering in a new geopolitics of food. On the supply side, extreme soil erosion, growing water shortages, and the earth’s rising temperature are making it more difficult to expand production. Unless we can reverse such trends, food prices will continue to rise and hunger will continue to spread, eventually bringing down our social system. Can we reverse these trends in time? Or is food the weak link in our early twenty-first-century civilisation, much as it was in so many of the earlier civilisations whose archeological sites we now study? This tightening of world food supplies contrasts sharply with the last half of the twentieth century, when the dominant issues in agriculture were overproduction, huge grain surpluses, and access to markets by grain exporters. During that time, the world in effect had two reserves: large carryover stocks of grain (the amount in the bin when the new harvest begins) and a large area of cropland idled under U.S. farm programmes to avoid overproduction. When the world harvest was good, the United States would idle more land. When the harvest was subpar, it would return land to production. The excess production capacity was used to maintain stability in world grain markets. The large stocks of grain cushioned world crop shortfalls. When India’s monsoon failed in 1965, for example, the United States shipped a fifth of its wheat harvest to India to avert a potentially massive famine. And because of abundant stocks, this had little effect on the world grain price. When this period of food abundance began, the world had 2.5 billion people. Today it has seven billion. From 1950 to 2000 there were occasional grain price spikes as a result of weather-induced events, such as a severe drought in Russia or an intense heat wave in the U.S. Midwest. But their effects on price were short-lived. Within a year or so things were back to normal. The combination of abundant stocks and idled cropland made this period one of the most food-secure in world history. But it was not to last. By 1986, steadily rising world demand for grain and unacceptably high budgetary costs led to a phasing out of the U.S. cropland set-aside programme. In recent years, world carryover stocks of grain have been only slightly above the 70 days that was considered a desirable minimum during the late twentieth century. Now stock levels must take into account the effect on harvests of higher temperatures, more extensive drought, and more intense heat waves. Although there is no easy way to precisely quantify the harvest effects of any of these climate-related threats, it is clear that any of them can shrink harvests, potentially creating chaos in the world grain market. To mitigate this risk, a stock reserve equal to 110 days of consumption would produce a much safer level of food security. Food shortages undermined earlier civilisations. The Sumerians and Mayans are just two of the many early civilisations that declined apparently because they moved onto an agricultural path that was environmentally unsustainable. For the Sumerians, rising salt levels in the soil as a result of a defect in their otherwise well-engineered irrigation system eventually brought down their food system and thus their civilisation. 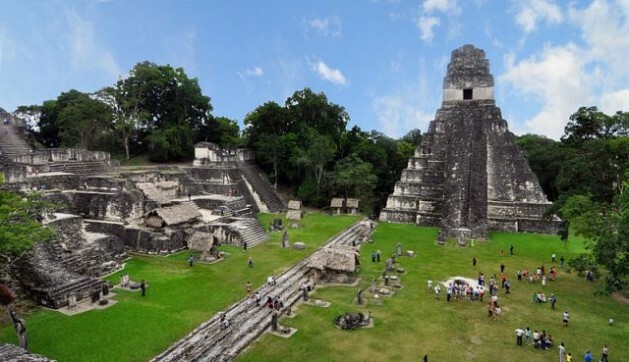 For the Mayans, soil erosion was one of the keys to their downfall, as it was for so many other early civilisations. We, too, are on such a path. While the Sumerians suffered from rising salt levels in the soil, our modern-day agriculture is suffering from rising carbon dioxide levels in the atmosphere. And like the Mayans, we too are mismanaging our land and generating record losses of soil from erosion. While the decline of early civilisations can be traced to one or possibly two environmental trends such as deforestation and soil erosion that undermined their food supply, we are now dealing with several. In addition to some of the most severe soil erosion in human history, we are also facing newer trends such as the depletion of aquifers, the plateauing of grain yields in the more agriculturally advanced countries, and rising temperature. Against this backdrop, it is not surprising that the United Nations reports that food prices are now double what they were in 2002-04. For most U.S. citizens, who spend on average nine percent of their income on food, this is not a big deal. But for consumers who spend 50-70 percent of their income on food, a doubling of food prices is a serious matter. There is little latitude for them to offset the price rise simply by spending more. Closely associated with the decline in stocks of grain and the rise in food prices is the spread of hunger. During the closing decades of the last century, the number of hungry people in the world was falling, dropping to a low of 792 million in 1997. After that it began to rise, climbing toward one billion. Unfortunately, if we continue with business as usual, the ranks of the hungry will continue to expand. The bottom line is that it is becoming much more difficult for the world’s farmers to keep up with the world’s rapidly growing demand for grain. World grain stocks were drawn down a decade ago and we have not been able to rebuild them. If we cannot do so, we can expect that with the next poor harvest, food prices will soar, hunger will intensify, and food unrest will spread. We are entering a time of chronic food scarcity, one that is leading to intense competition for control of land and water resources – in short, a new geopolitics of food. *Lester Brown is the president of Earth Policy Institute. For further reading on the global food situation, see Full Planet, Empty Plates: The New Geopolitics of Food Scarcity, by Lester R. Brown (W.W. Norton: October 2012). Or read more here. U know I may have taken you seriously, but, I just couldn’t get past the fact that you misspelled civilization throughout the entire article. Also, it’s YOU, not U since you are judging this article on misspelling. Since you didn’t know the English spelling (that that Is the spelling of “civilisation”, accepted internationally, and throughout the entire freaking Commonwealth (Canada, Australia, New Zealand, India and so on, over 100 countries), so we’re talking of an opinion of more than 100 to 1) -I guess the ignorance is on you, sweetheart. I guess since the Americans rule in the publishing world by their glut consumption of Canadian trees, they get to force they’re um, “bastardization” of the English language on everyone else (accompanied by the default setting of spell checks to “American English” on the interwebs). This includes their “quote rules for stupid heads so we don’t have to teach grammar that’s logical” just take a shortcut to help with their school budget constraints. I don’t mind spelling differences (language evolves), but their rules on quotation marks are for idiots. -How’s that for a little education? Didn’t know ‘merican publishers force American spellings and American grammar idiocy down every writer’s throat they publish, whether they’re American, or not? Often even on internet publishing? Regression R US, for export. It’s the mark of the level of centrism (self-absorption), and the desire to homogenize everyone else, that is the mark of its “success”; that people are so unconscious of where the difference lies; they’d generally make the same castigation you made, of what is not, in fact, a spelling “mistake”. Your mis-perception is actually contingent on the Americanization of English (which has actually been the dictate of their publishers, for decades), “Americanization” being the word, when it comes to their eradication of what still stands as logical grammar. It’s literally the imposition of arbitrary American “illogic” on the English speaking world. If you want to know there are differences, google logical grammar, or change your Word spell check for a few days and see the differences.